Render the model using the current renderer producing a color image in a separate display window. In the Layers dialog box, select one or more layer names, and click in the Material column. In the Layer Material dialog box, set up material properties. On the Edit menu, click Object Properties. In the Properties panel, on the Material page, set up material properties. Add spotlights or other lights. 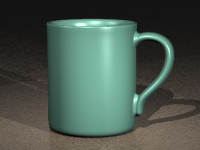 Shade objects with a simulation of the rendered view. Manage libraries, previews, support, texture size.